This article is part one of a two-part series. Read part 2 here. ﻿How do cities design themselves? Tenochtitlan — Image via Flickr. At a basic level, a city can be understood as two types of spaces: public spaces and private spaces. 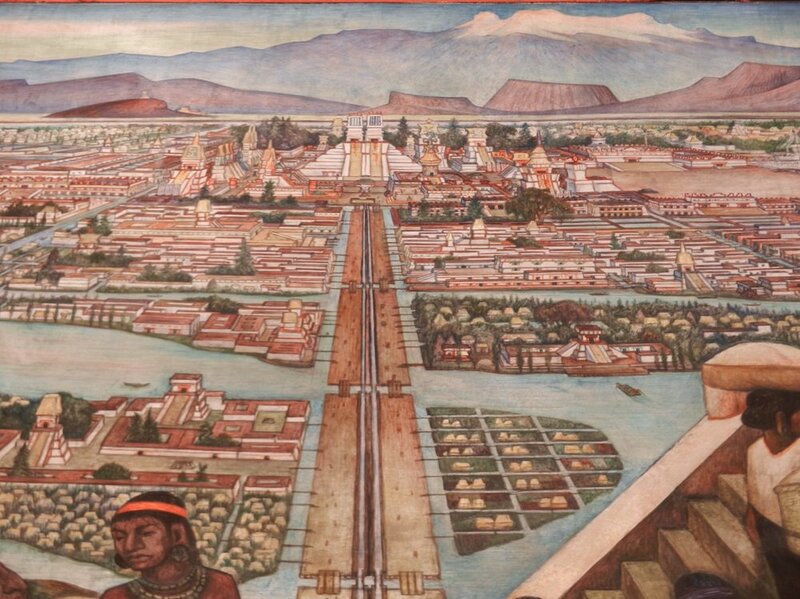 For as long as humans have built cities, we have been deeply interested in the top-down design of public spaces, from Hippodamus’ street grid to the monumental plazas of Tenochtitlan. The centralization of this element of cities makes sense: urban streets, parks, and plazas are capital- and land-hungry public goods, which might be underprovided if a central authority did not make sure land was set aside for them. At the same time, the design of private spaces has historically been a largely distributed affair, with the built landscape between blocks and parks designed in a decentralized process among thousands of smallholders, including residents, businesses, developers, and architects. This changed in the twentieth century. In virtually every major American city, local governments regulate every detail of urban design, including maximum building heights, maximum lot coverage, minimum setbacks, and maximum floor area ratios. While the original intention of these rules varies, their cumulative effect is to completely control the minutiae of how we develop urban land, such that in most cities, the job of an architect or site planner is mostly one of rote compliance. On top of these traditional controls, cities are increasingly adding explicitly design-oriented regulations, including things like ground-floor transparency requirements, contextual setbacks, and design rules for facades. A steelman argument for this centralized approach to urban design might read something like this: The way buildings engage with the public realm—including facades and site plans—can impose positive or negative side effects, or externalities, upon neighbors. For example, along a residential street, a building with the same facade treatment and deep setback as its neighbors can create an orderly streetscape, producing a positive externality. Along a walkable commercial corridor, on the other hand, a building with a deep setback accommodating a large surface parking lot might undermine the success of the corridor as a whole, producing a negative externality. Thus, it is incumbent on planners to control urban design, both to cultivate positive externalities and prohibit negative externalities. There are two issues with this system: First, planners often lack the knowledge needed to know when to attempt to control urban design at all. Unlike traditional externalities, such as noise, smoke, light, or odor, “good” and “bad” design are ambiguous and subject to disagreement among reasonable people. A design that might seem to you like a disruptive and ugly oddball might seem to someone else like a welcome and exciting bit of variation. We can conduct surveys and charrettes to get a general sense for what a select group of residents might like and achieve something resembling consensus on good and bad design. But even in this optimistic (and highly expensive) scenario, planners lack the knowledge to know whether the benefit of the positive externality gained—an orderly street—will outweigh the unseen benefits of potential design scenarios that will never materialize—such as a desirable but unpredictable architectural shift, or an unplanned evolution in the function of the street. Such unexpected happy accidents have a role to play in improving our cities over time, but not if they aren’t allowed to occur. Without received knowledge regarding good and bad design, or the opportunity costs of any new regulations, planners simply can’t make a robust externality argument for most design regulations in the vast majority of circumstances. Second, even if planners could identify circumstances in which design regulation was appropriate, we (I say this as a practicing planner myself) lack the knowledge needed to actually set design standards for every single lot, even at a small scale. The knowledge needed to ascertain the ideal (and feasible) design of any given lot is distributed among the many residents, tenants, architects, developers, and financiers involved in developing a site. These are, after all, the people with the greatest local knowledge and incentives to succeed in their design. Yet even these individuals are guessing at the ideal urban design for a site, and they often guess wrong. The key difference between centralized urban design and distributed urban design, however, is that when a failure occurs under the distributed system, subsequent actors can correct. Under the centralized system, we’re typically stuck with suboptimal design standards for decades. Centralized urban design is further undermined by the fact that conditions in a healthy city are constantly changing. Cultural preferences related to design features such as setbacks evolve. Rising land values may mean that future buildings need to economize on land and build up. Even if we could all agree at a given time that a block needs top-down design regulations, that these regulations should be X, Y, and Z, and that these standards are feasible under present market conditions, conditions will almost certainly change in the future. In addition to learning from past mistakes, a distributed system of urban design provides those with skin in the game the power to iterate and modify inherited practices, testing out new urban design configurations. The professional planner is trained to yearn for tighter urban design controls, as if cities without comprehensive, top-down design control would devolve into chaos and disorder. In reality, cities contain within themselves mechanisms that allow us to gradually discover optimal urban design across time, and being a good planner requires that we humbly seek to understand, empower, and where necessary mediate, these processes. This is Part 1 of a two-part series. In Part 2, coming tomorrow, I will delve into a specific example—front setback regulations, or how far back a building must sit from the street—to illustrate how cities can “discover” good design over time rather than impose it up-front.